When you want a good seat at a restaurant, schmooze with the maître d’. When you want a great seat at a concert, it helps to know the performer. When you want a seat on a plane, however, no amount of schmoozing or name dropping works. Moreover, no amount of points or miles can get you on a flight without available award seats. IdeaWorks’ recently released 6th annual survey of award availability revealed that Southwest Airlines and JetBlue Airways offered abundant award seats compared to rivals. Southwest Airlines had seats available on 100 percent of the survey’s searches, making it the number one domestic airline. JetBlue Airways, meanwhile, had availability on 87 percent of the survey’s requests. IdeaWorks, a consulting firm in its 20th year, based the survey results on over 7,000 booking queries on 25 airline frequent flyer program websites. The survey reflects the availability of saver-style awards if the airline offers them. The top five spots for overall award seat availability went to: airberlin and Southwest with 100 percent; Virgin Australia with 96.4 percent; Air Canada with 90.7 percent; Singapore with 90 percent; and JetBlue and Lufthansa tied for fifth place with 87.1 percent. Southwest and JetBlue also stand out among other airlines in that their award ticket prices are based on the current cash value of the seats. Dallas-headquartered Southwest and New York-based JetBlue use points as their program currency instead of miles. Frequent customers earn points which translate into some type of award, such as a discount, freebie, special customer treatment or an award seat. The higher the seat’s price tag, the more points needed to snag it. What that means is that there’s no capacity control or limits on those airlines. If a traveler is short points for a certain flight, chances are a seat will be found within their point balance on another flight. Airlines using mileage-based programs, on the other hand, limit award seat available and often only offer them at a fixed price: i.e., 25,000 miles for a domestic trip. Southwest’s average price was 9,457 points per round-trip award ticket. The average for JetBlue was 18,003 points. For Delta, American and United, the number was 23,214 miles, 26,607 miles and 27,393 miles, respectively. Southwest switched to an awards program based on cash ticket prices in 2011, and customers liked the change. The number of people enrolled in Southwest’s Rapid Rewards program has swelled 65 percent since the shift. United and Delta are also making the shift from purely distance-based programs by basing the miles earned on flights on how much the tickets cost. The move has benefited customers paying higher fares, leaving cost-conscious travelers racking up much fewer miles for their trips. Additionally, award seat availability is still very closely controlled on both airlines. When looking at the big U.S. airlines, United had the best availability among the three. United had saver seats open 75 percent of the time. American was next with 67.1 percent, followed by Delta with 57.9 percent. When looking into long-haul flights of 2,500 miles or longer, the number of available award seats greatly diminished. 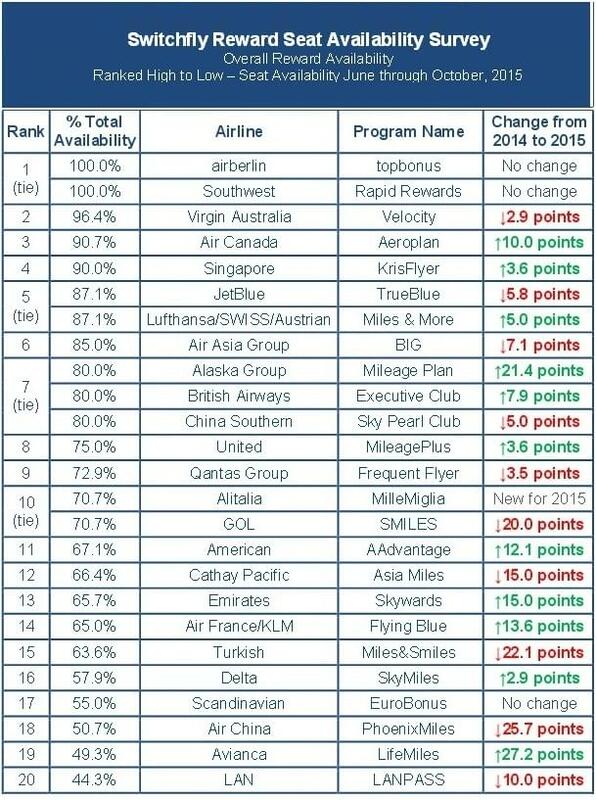 Here again, United came out on top with seats on 67.1 percent of IdeaWork’s long-haul reservation requests. American again scored second, but availability fell to 55.7 percent. Delta didn’t fare so well in this category, scoring near the bottom of the 25 airlines surveyed with seats available only 31.4 percent of the time. The sole airline rating lower in long-haul availability was Scandinavian. The top five airlines for long-haul availability were: Air Canada with 90 percent; Singapore with 84.3 percent; China Southern with 81.4 percent; Lufthansa with 74.3 percent; and Emirates with 68.6 percent. Travelers can take comfort in the fact that award availability at the saver level is increasing. Seats were available on 74 percent of all 2015 queries. That’s up from 66 percent five year ago, according IdeaWorks.